Canon Pixma Printers make it possible to unite fast speed and user friendly features with advanced functions of printing, scanning and copying. All these come together in a sleek package, distinctive of Canon. This multifunctional wireless printer comes in a sleek design of chrome and black combination. If its outer appearance is impressive, the discerning eye will, further, be overwhelmed with its several features. It comes with a 3.8 “ LCD where you can monitor the images of photos that you would want to print with the help of the printer’s resolution of 9600 x 2400 dpi. You have the option to edit your pictures by means of the auto scan mode and photo fix features. The Canon Pixma MP990 is a versatile device since it can work in synergy with most cards such as PictBridge, digital camera cards and flash memory cards, allowing you to print directly from them without the use of a computer. On the other hand, it can also be connected to your laptop or personal computer by means of its usb port. This printer is capable of duplex printing and can print borderless photos. It prints well on both white and glossy paper. It is WiFi ready and has Ethernet capabilities for network sharing in a workplace. This is very much like the Canon Pixma MP990 since it is wireless, has Ethernet capabilities and is capable of dual sided printing. It, likewise, does well in copying both documents and photos. It has a feature of additional printing options which is made possible by 2 trays that have a paper capacity of 150 pages each. This all-in-one printer gives more value for your money. 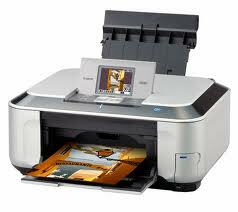 This is a less expensive version of the first two printers, being capable of wireless and duplex printing. The difference lies in its smaller 2” LCD. It is equipped with the Dual Color Gamut Processing Technology that makes good quality copies. It, also, has an auto fix feature that makes it possible to enhance your photos. It comes with an Easy Scroll Wheel that makes it less of a hassle to choose the functions you need. This multifunctional printer is the least expensive among all the printers mentioned yet it is a good buy considering the vibrant photos it prints out. It may not have other features, though, such as wireless support and duplex printing capability. If you are not so particular with print speed, you may be contented with this printer. Its first page can be printed out in 15 seconds while 3 succeeding pages can be completed in 29 seconds. If you are not so much of a techie person, you can be happy with this printer which, incidentally, has a memory card slot and a 1.8” LCD. The Canon Pixma MP490 has a QuickStart feature which makes it easy to go to the different printer functions once it is turned on. You can, also, save a lot on this printer with its 2 ink cartridge system. You only need to replace 2 instead of the usual 5 ink cartridges that other multifunctional printers have. Going through the features offered by the different printers such as the Canon Pixma MP990, Canon Pixma MP640, Canon Pixma MP560 and Canon Pixma MP490, you wouldn’t be surprised why this brand has quite a number of supporters. These all-in-one printers are like having 4 separate machines in one compact device. However, they do not sacrifice one function for the other. Despite its integrity in producing high quality pictures, these Canon Pixma Printers do not forego their total chic look which makes them a “must have” for all the techies out there. They come in different prices so a consumer can, easily, find one to fit not only his preference but also his budget. Simply click here to return to Best Printer Review.